This recipe has certainly evolved over the years. My mom always made these for cookie exchanges, bake sales and at holiday time. When I was working as a pastry cook under brilliant pastry Chef Stephanie Krizman at Windy Ridge Bakery in Park City, UT, I learned how to scale this to to a commercial sized recipe. I bring that version to you, as having extra cookies laying around during the holidays never seems to be a problem. 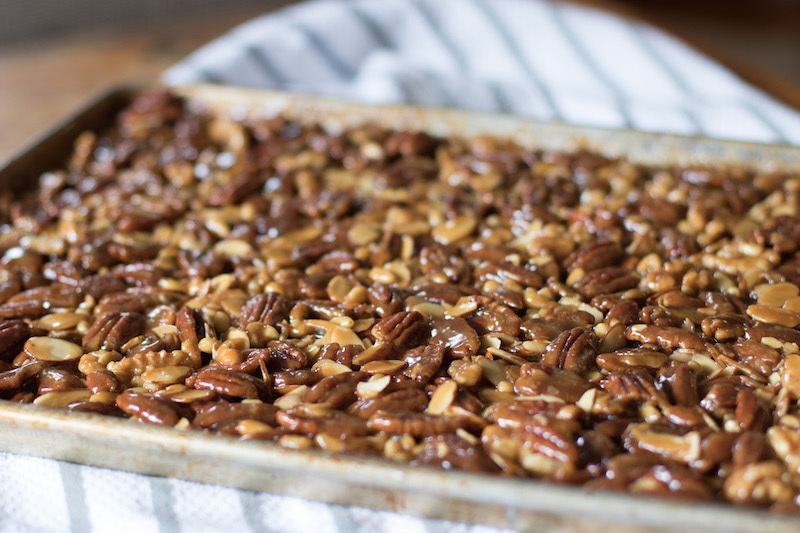 This is Stephanie’s recipe for bar base and works beautifully. 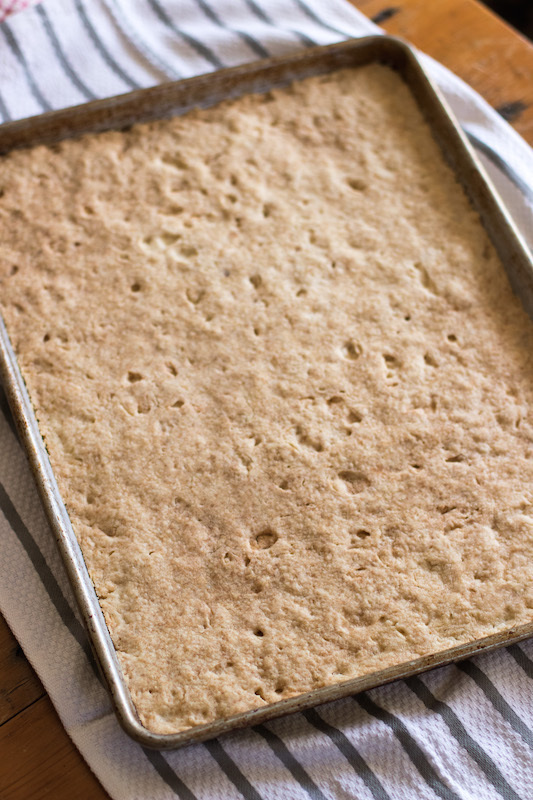 Make sure you are using a commercial 1/2 sheet pan, versus a “cookie sheet”. 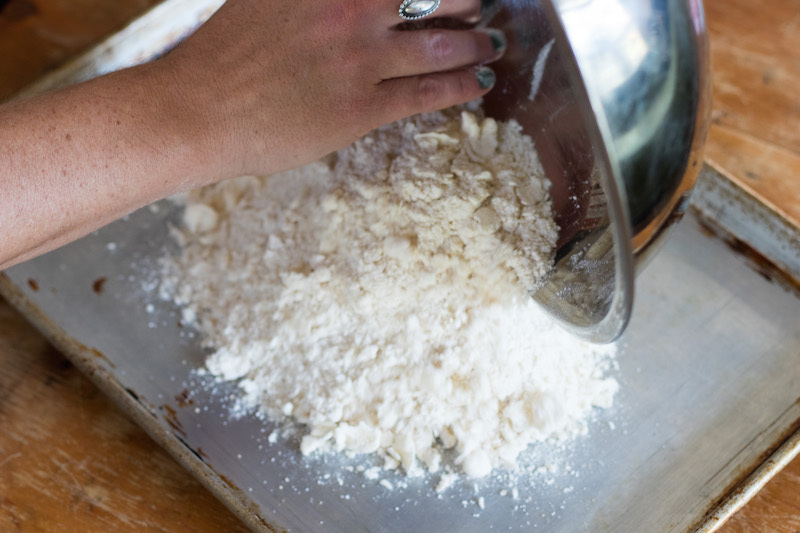 Combine all dry ingredients. 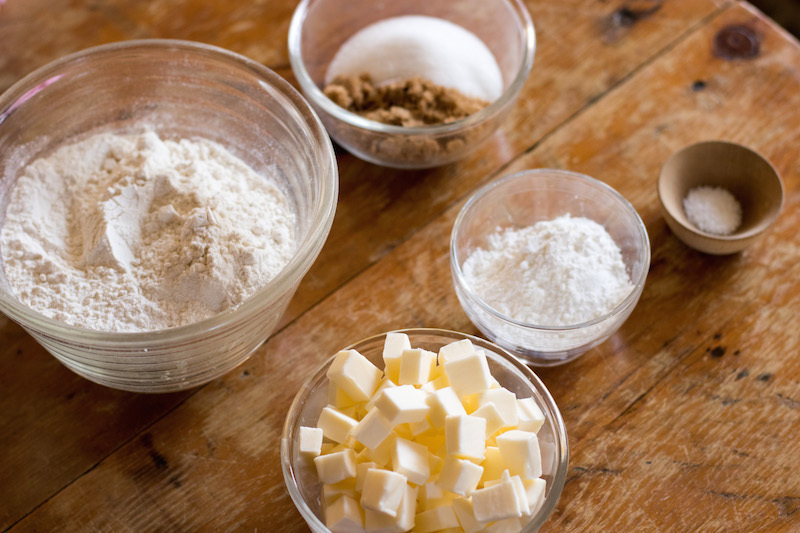 Cut in cold butter until dough has a flaky texture. 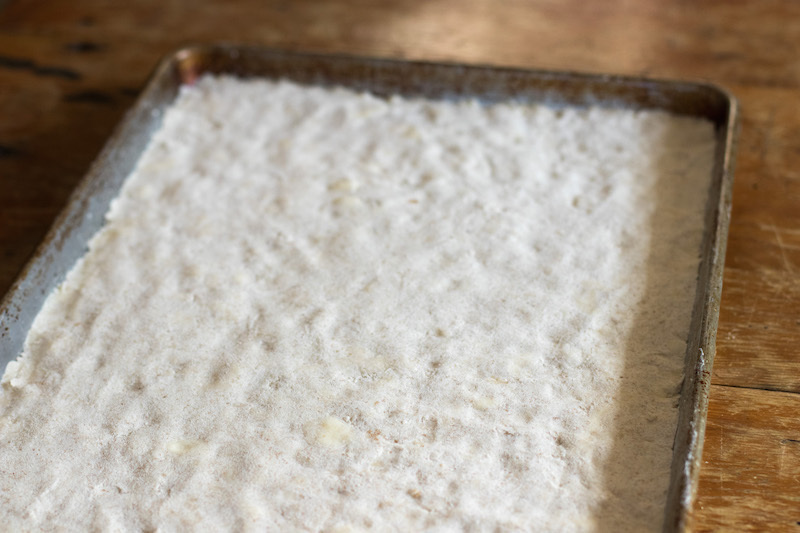 Press into a commercial half sheet pan, taking cake to ensure a consistent thickness. Parbake the crust for about 20 minutes or until light golden brown. Be sure to rotate the pan once in the middle of baking. This recipe is very forgiving and flexible. I’ve used both salted and unsalted butter and both light and dark brown sugar (and a mix!) with no ill effects. This is also a great way to use up that crystallized honey you have laying around. You can use any nuts and typically I do a pantry sweep to make different combinations. 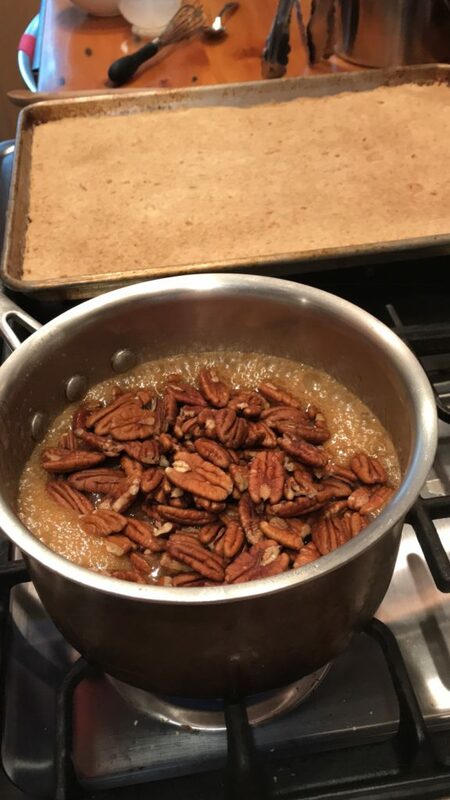 I especially like pecans and the visual element that sliced almonds provide, but I’ve used walnuts, almonds, hazelnuts, macadamia nuts, cashews, pine nuts, and pecans in various proportions and cuts, all with delicious results. 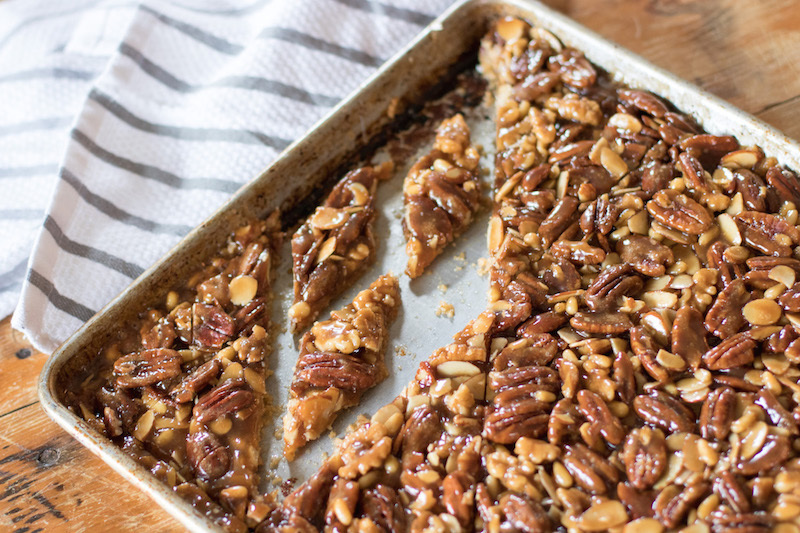 Once cooled, these bars can be topped with raspberry jam (my mom’s way!) or drizzled with chocolate. Enjoy! Melt butter in a 2 quart saucepan. Add sugars and honey and boil for 2-3 minutes. While stirring with a wooden spoon or whisk, add the cream slowly. The mixture will bubble up so be careful as you add cream. Keep stirring until all the cream is incorporated. Add nuts and stir until all are evenly incorporated. 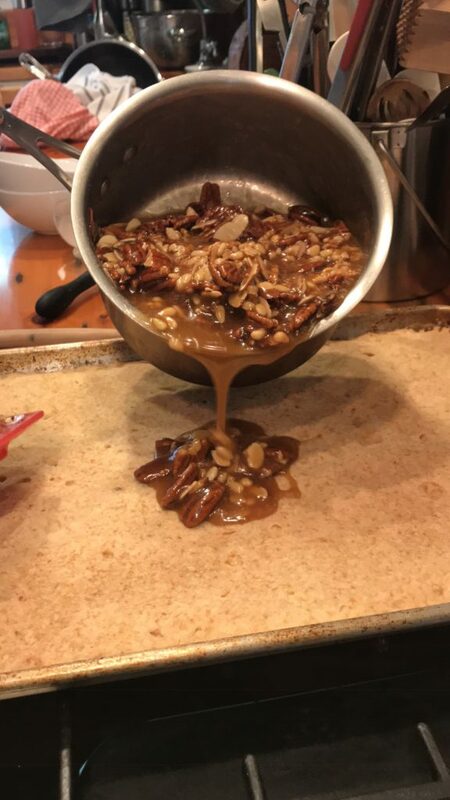 Pour onto parbaked crust, taking care to make sure nuts and caramel are evenly distributed. Bake at 350 degrees for about 25 minutes. Let cool completely before cutting. This can yield almost 50 bars depending on how you cut them. They will keep for about 5-7 days if layered in parchment or wax paper in an airtight container, although typically they don’t last that long.